We&apos;ve been proudly roofing since 1985. Manufactured housing makes up 25 percent of the residential market in the Sunshine State, the majority found in the roughly 2,700 mobile/manufactured home communities with 50 or more dwellings. Being relatively inexpensive and requiring little maintenance, mobile/manufactured homes are ideal not only for the huge population of Florida retirees, but also for young families buying their first homes. ​According to the Manufactured House Institute, manufactured homes cost anywhere from 25 to 50 percent less per square foot than traditional site-built homes. They’re much more efficient than site-built housing to assemble, and their construction quality can be surprisingly good, with factory control of key elements such as materials, fixturing and indoor weather conditions. Unfortunately for mobile/manufactured home dwellers, indoor factory weather quickly disappears under the hot Florida sun. For it is this brutal sun - not tornados - that more commonly gives mobile/manufactured home owners trouble. While posing less physical danger, the sun can make life very uncomfortable and cause energy bills to soar. 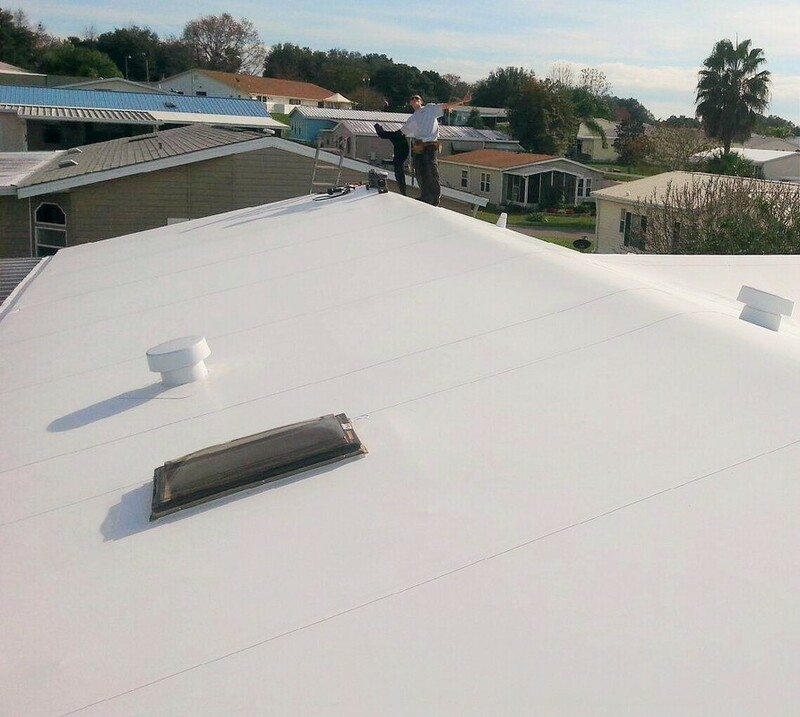 No part of a home sees more beating sun than the roof, which is why Florida is regarded as the most severe roofing environment in the U. S.
The need for increased protection from the sun is not lost on Florida roofing contractor Bob Mays of Comfort CoverSystems, Inc. in Clearwater. His patented roofing system has been used extensively in Florida since the mid 1980’s, not only on mobile/manufactured homes, but also on similar structures such as aluminum roof additions and low-slope gravel roofs on conventional homes. Mays first worked on methods of insulating mobile/manufactured home roofs in 1978, while employed by an insulation company. “We eventually found that the best and quickest way of insulating roofs was to install a layer of insulation over the current roof, and then cover that with a single-ply membrane,” he reports. ​In 1985, Mays received a patent on his current system, consisting basically of a single-ply membrane mechanically fastened over rigid, foil-faced insulation board, and finished around the edges by a termination bar. Mays found that the durable single-ply membrane provides maximum protection and ease of application, while offering a reflective white color that helps reduce energy costs. Over 400 million sq. ft. of this membrane has been installed worldwide, with 20 million sq. ft. used successfully in Florida. The single-ply membrane, developed with an advanced thermoplastic polymer provides exceptional resistance to the worst heat and UV rays, rain, wind, salt exposure and contaminants and other pollutants. The single-ply roofing membrane has outstanding durability and weatherability, and allows it to retain its physical properties over time. The membrane stays flexible without becoming brittle or cracked. Another drawback of the metal roofs installed by mobile home manufacturers is “roof rumble” - the noise made when wind passes over the roof, causing it to vibrate. Trying to stop roof rumble by weighing down the roof with cement blocks or tires can cause more trouble than the noise itself. And while “rumble buttons” - large washers screwed through the metal roof and into the rafters - can be a short-term solution, they can tend to work loose and cause leaks because of the expansion and contraction of the metal roof. 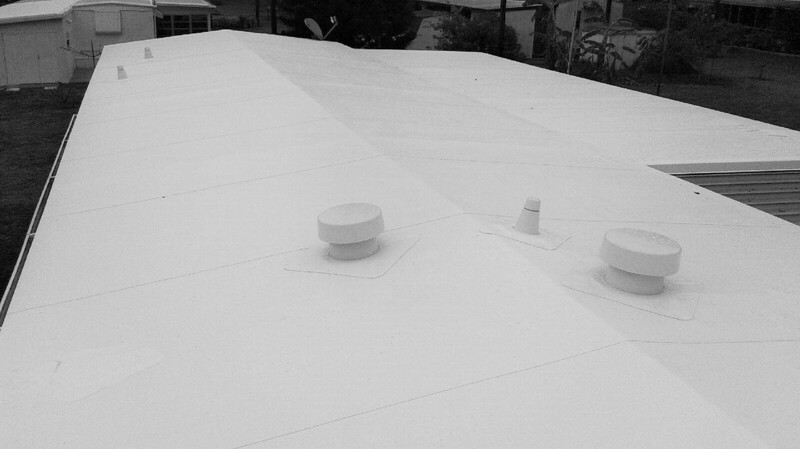 An insulated, single-ply roofing system is quiet and effectively eliminates roof rumble. Many of the newer double-wide mobile homes use shingle roofs. But these also can fail early, especially when manufacturers use only a single layer of shingles, instead of two or three layers found on a conventional site built home. According to Mays, a single course of shingles often is used on a mobile home because of second layer of shingles would add too much weight to the structure. After time, the edges of the shingles curl, stiffen and even break, allowing wind-driven rain under the shingles. “A low-slope roof with just a single course of shingles can’t stand up to the great amount of ultra-violet light and heat in Florida,” he says. A single-ply mechanically attached Comfort CoverSystems’ roof installs right over the existing roof, providing a lightweight roof cover that is well within the weight limits for mobile/manufactured homes. The alternatives - increasingly frequent re-coating of the original metal roof as it deteriorates, or more expensive tear-off and re-shingling or roof-over with a metal roof - simply don’t offer the home owner the same value and convenience as a relatively low cost, single-ply roof-over. “Unlike metal roofing systems, we’ve found the single-ply system is very easy to put down,” says Mays. “We make up most components in the shop, and when we get everything out to the site, we can complete the job in one day - maybe 5 or 6 hours. Besides saving time, which means less labor cost, we also give the customer less noise and disruption. We come in, put on their new roof, and we’re gone. For homeowners who’ve ever experienced the lawn-clogging debris of tear-offs, the ear-pounding hammering of re-shingling, or the costly multi-day installation of a metal roof-over, Comfort CoverSystems’ offer can be quite attractive. As part of its roofing package, the company also replaces all vents, plumbing stacks and range hood vents with new aluminum vents, giving homeowners an entire new roof system.